We’ve been organizing photo files all week and came across these shots of a favorite discovery that we might have would driven right by had it not been for Mr.D and his interest in all things communications and typography. When Mr.D was in college, he studied Communication Art & Design and Typography with Prof. Rob Carter who has written volumes on graphic design, including American Typography Today and Typographic Design Communication. 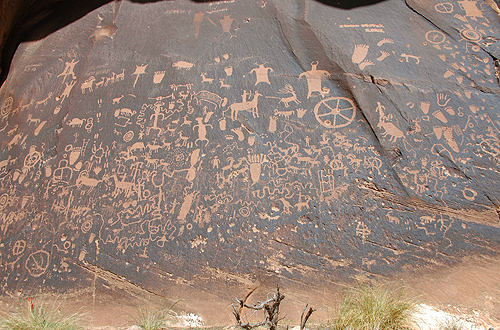 Carter is also an avid hiker, born in Utah, and it was in his class that Newspaper Rock was brought up as an example of using symbols as communication. 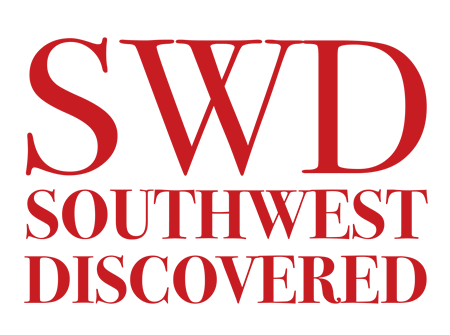 When we think of typography, we think of words. And words are actually symbols and letter forms that we understand and learn to communicate with. We turned onto Utah Route 211, an unassuming two lane road that took us further into the middle of nowhere. 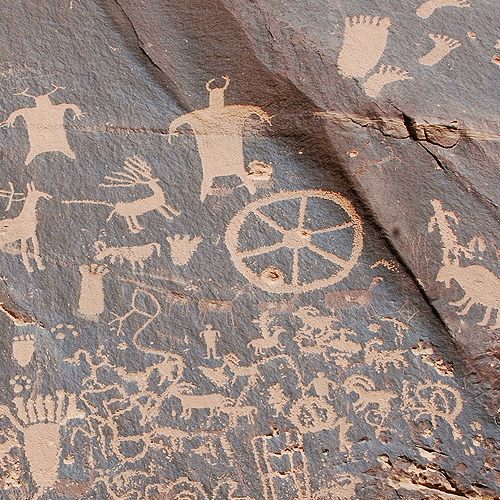 While in the Canyonlands area, “middle of nowhere” typically means you’re going to come upon something awesome. 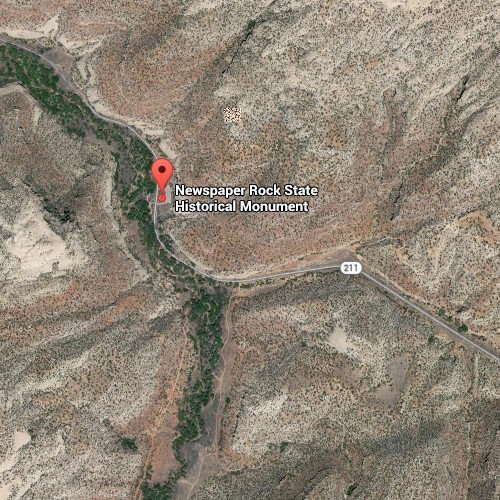 A barren drive to the east, then a sweeping turn to the right into a green canyon, and there it was…..
A canvas of rock with dark desert varnish, covered in over 650 petroglyphs. Easily accessible. 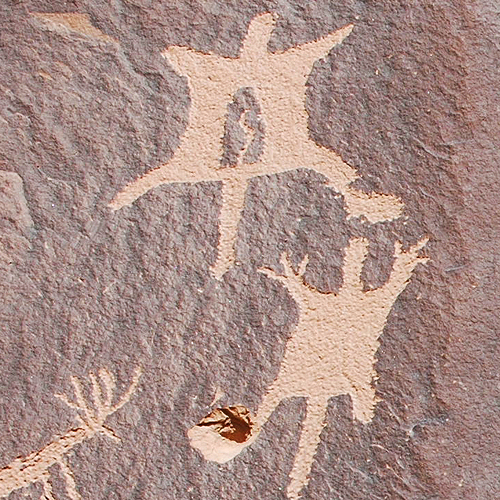 While so many petroglyph sites in the Southwest require a long climb and at times a strenuous hike, this one is right off the road. 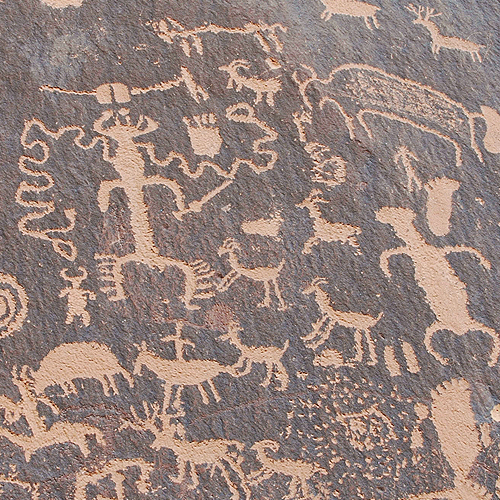 The Navajo call it Tse’ Hane’ — rock that tells a story. 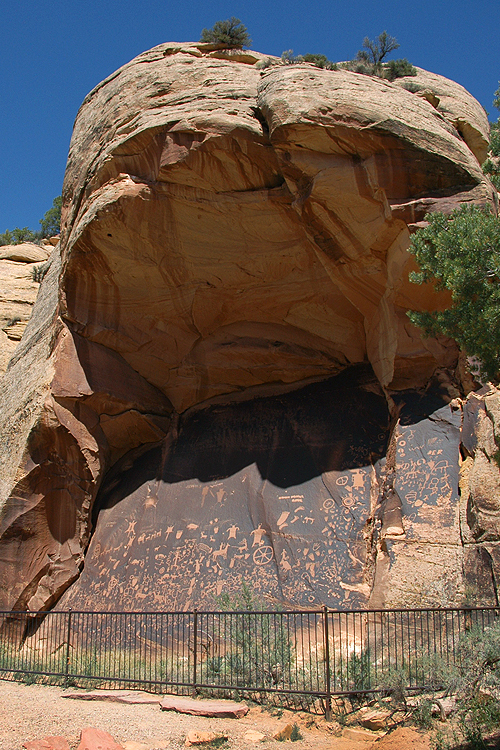 Desert varnish is manganese iron that darkens over sandstone. 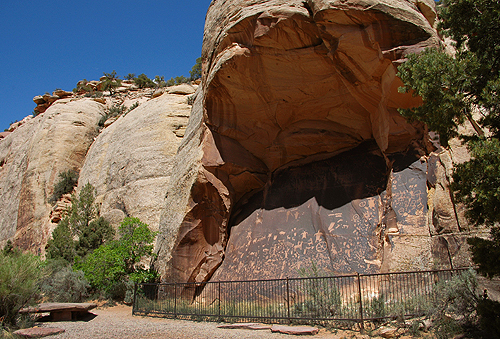 The ancient artists figured out how to use tools to etch and pick into the surface to reveal the lighter sandstone beneath. 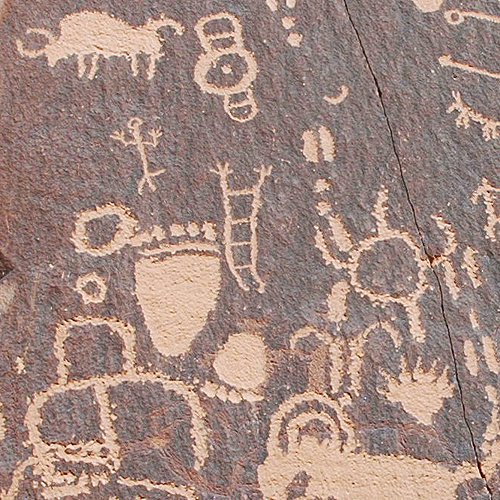 Petroglyphs etched into rock, as opposed to Pictographs that are painted onto rock. 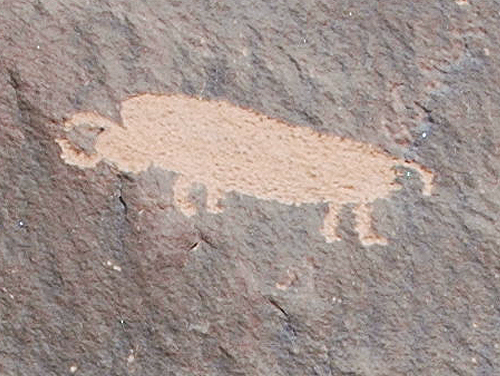 The first carvings date back around 2,000 years by pre-historic peoples believed to be from the Archaic, Basketmaker, Freemont and Pueblo cultures. And then in historic times from Ute, Navajo, and Anglos. We stood there for a half hour or so, interpreting images and talking about how we could imagine the ancient storytellers standing in front of the panel, pointing to the symbols and communicating their history. 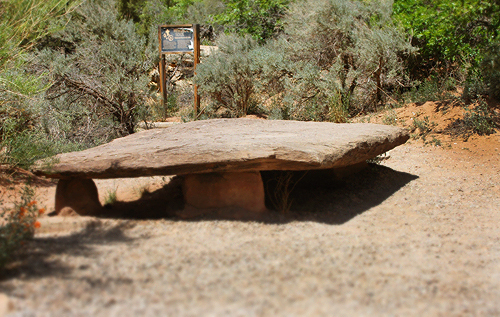 This reminded us of a young Navajo park ranger from Mesa Verde who once told us that you might be standing in an area meant for ceremony or dancing, or sitting in a room meant for sleeping, and then an elder would come in to share stories and the room then became a library. Elders are walking libraries. During our short visit we met more than two dozen people, all from various parts of the world. Next time we plan to bring a picnic lunch so we can sit on the huge stone bench and take it all in again. 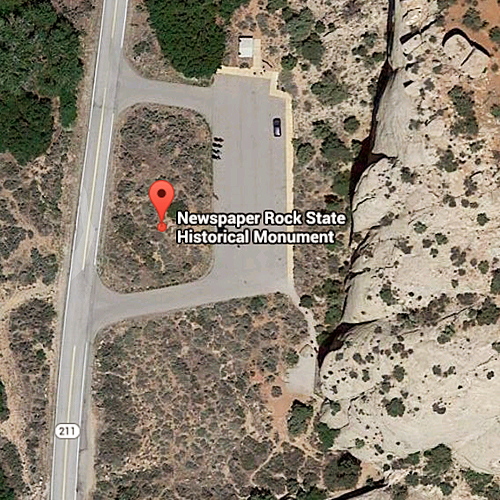 The rock is located to the bottom right of the parking lot, you can see the little path leading to the cliff face. If you’re planning trips to Arches National Park in Moab, or the Canyonlands, be sure to leave room in your schedule for Newspaper Rock. 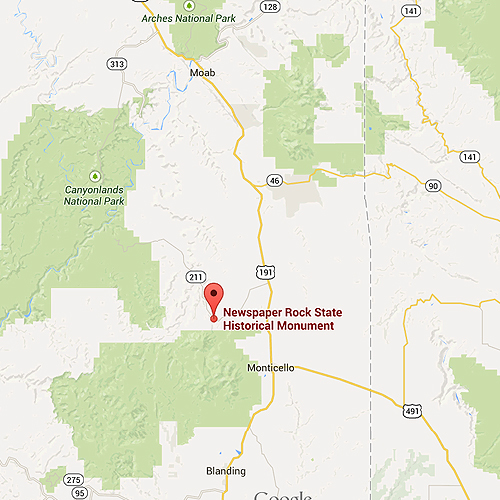 It’s easy to miss the turn-off, so gauge about 24 miles northwest of Monticello, Utah, or 52 miles south of Moab. It is a state historic monument. No restaurant or gas station.